I have always loved books. My mother says she read to me constantly as a baby, long before I was conscious of what books were. As I grew older she says I was always asking her to read to me. Books, children’s books, comic strips and comic books... everything that had words on a page. She smiles as she talks about how she would set the words to song to put me to sleep at night. She winks when she tells me how I would correct her if she skipped the words to well-known stories. For me books have always been magic. They are portals to other worlds, the most important of which has been my own imagination. As you might guess, I learned to read early. The mystery of what was contained on these strange marks on paper we call the alphabet was one I needed to solve. Apparently, for all of her indulgence, I needed more time with books than Mom could give me. By the time I started first grade I was already living between the pages. One of my most-repeated anecdotes of that time was when the teacher, Mrs. Baldwin, yelled at me for not paying attention. She was teaching the alphabet to the class and I was bored, so of course I grabbed a book from the shelf in the back to keep myself occupied while the rest of the class got caught up. Yeah, I was an arrogant little snot, but I was bored. I still reach for a book when other people are boring me. I grew up in the country so there wasn’t a local library. My small school was serviced by a library bookmobile and I couldn’t wait for the weekly visit. Luckily it continued to make rounds during the summer months as well. The librarian, Mrs. Berryman (who I have alreadywritten about), loved me because of my love of books. By fourth grade a new grade school had been built, consolidating several smaller schools and gave Mrs. Berryman a permanent home and large new library. I practically lived there. I graduated to chapter books pretty quickly. 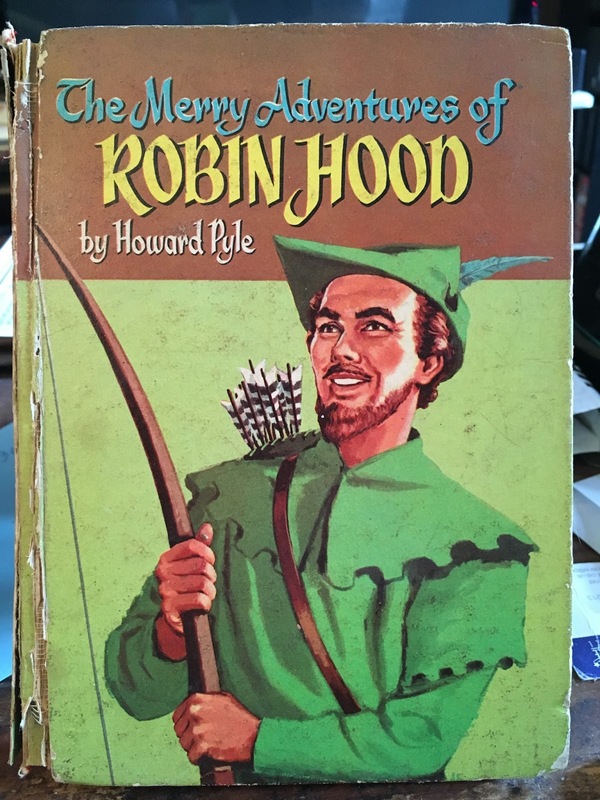 The earliest full books I remember reading were the Howard Pyle version of Robin Hood (I spent a summer writing a play based on it and trying to recruit my friends to be in it. It was, sadly, never produced. 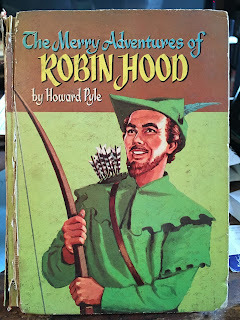 Luckily, in sixth grade I was cast as Will Scarlet in a school musical production). I also read both Tom Sawyer and Huckleberry Finn. In 4th grade my classmate Charlie Brown (yes, that was actually his name), reenacted the scene from Tom Sawyer where the boys first encounter Injun Joe. There were a series of books on the library shelves that I plowed through. 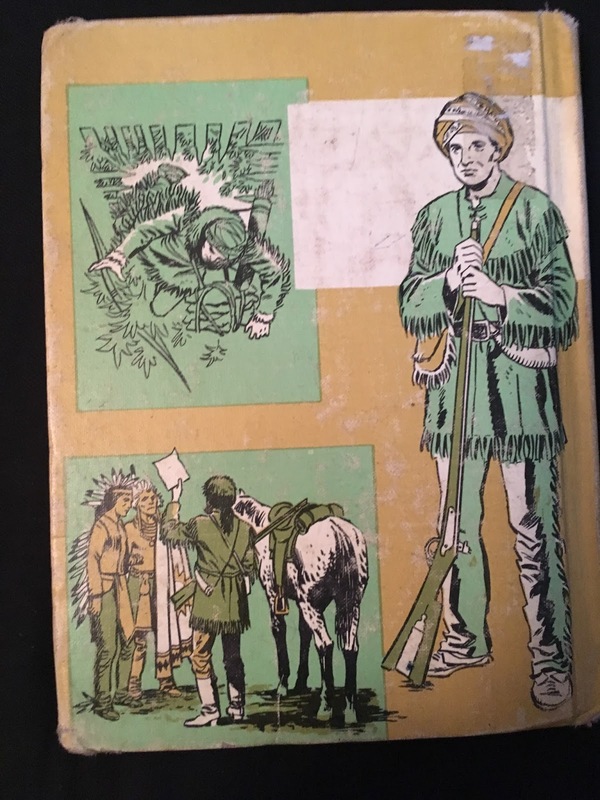 They were a series of biographies of figures from American history, written for children. I specifically remember a few: George Washington, Abe Lincoln, Kit Carson, Brigham Young, Betsy Ross, and many others. I read them all, some many times over. I credit these with my interest in history which eventually led to one of my undergraduate degrees. One in particular stands out in my memory, but not because of history, but because of art. 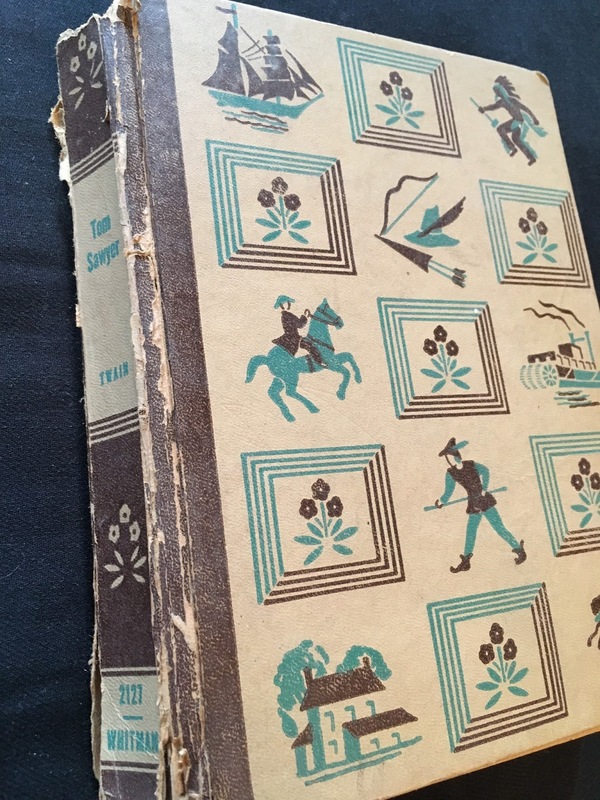 The book was a biography of the Cherokee Indian Sequoyah, inventor of a written alphabet for the Cherokee language. The cover of this book, like all of the covers in this series, was covered with drawings, done in the inked style of the comic books I was so familiar with. In third grade all of the boys were obsessed with cars, based on the Hot Wheels and Matchbox toy cars. I had a bunch of these, but I didn’t have the same obsession. Trapped indoors for recess in the winter everyone was drawing their favorite cars. I tried, but just couldn’t get the hang of it. One of my regular tormentors made fun of my inability to draw. One day, while the others worked at their cars, I did a freehand drawing based on the art on the book. It was, in my memory at least, really good. Okay, really good for a third-grader. My teacher praised it. So did other kids in my class. This whole experience stands out plainly in my memory. I pinpoint this drawing of Sequoyah, unfortunately long lost to the ravages of time, as THE drawing that made me aware that I had some talent. The one that eventually led to the art I still do today. The problem with memory is that it is incomplete. I have spent many years of my life trying to track down this series of books. Unfortunately, I had no idea what the titles were, or what the series was called. I tried my Google-Fu with every variation of ‟American biographies written for children in the 1960s” you can imagine. Nothing that ever came up seemed to match. My visual memory for these, especially for Sequoyah, is strong. I would know it when I saw it. But many image searches later and I was still unsuccessful. Every trip to a used bookstore for the last twenty years included a perusal of the children’s section. Still, no luck. A month or so ago I was in the main branch of the Carnegie Library. This is not an unusual occurrence. I typically do two things when I’m there; I look for very specific books that are next on my reading list, and I browse the shelves to see what catches my eye. I frequently discover books and authors I have never heard of before. That day a book on a display caught my eye due the title. Morningstar: Growing Up With Books by Ann Hood is not something I would have ever been aware of except by the synchronicity of it being there right when I have been researching the concept of Lucifer Morningstar for another project I’m working on (not a Satanic one, I swear). It’s also the name of the character I am currently playing in a superhero roleplaying game. 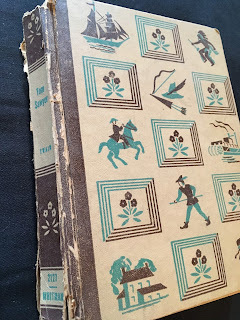 I picked up the book, discovered it had nothing to do with my research, but saw that it was a memoir about a woman my age and the significant books she had grown up with. Good enough for me, so I took it home. On page seven of her introduction she mentions a series of of books in her childhood library called Childhoods of Famous Americans. Two minutes on Google and I had it. 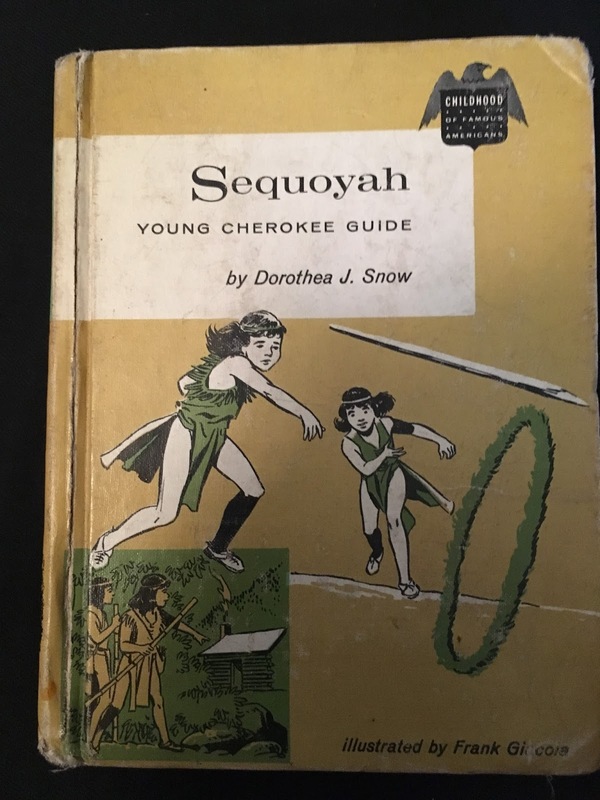 Sequoyah: Young Cherokee Guide by Dorothea J. Snow. I saw the picture of the front cover and I knew my search had ended. But it hadn’t. The thing is, there are multiple printings. I now realize that I had actually found the book in my searches years ago and didn’t recognize it because it had a different cover. I looked around Amazon and Ebay and found copies but none of them showed the back cover. I finally ordered one with the front cover I recognized. It arrived a couple of days later and I excitedly tore open the package only to disscover the back cover was blank. I had the book, but what I really wanted was the drawing. So, more research. I discovered that the cover artist, who also did illustrations for the interior (all of which lit up memory switchboards in my brain), was Frank Giacoia, a name I knew from the hundreds of comic books he pencilled and inked in the 1960s and 70s. I found another copy for sale with a different cover, but by the same artist. I ordered it. I was once again disappointed. Third time’s the charm. Through Alibris I found a store in Florida that listed four copies in stock. None of them had pictures. By this time I had found a photo of the back cover with the drawing I wanted, so I wrote to the bookseller with the photo. A woman named Virginia wrote back immediately that she would go their basement and check the overstock. Four days and eight dollars later and I held the book in my hands. I read it last night. My eyes scanned words I haven’t seen in nearly fifty years. I stared at the artwork and remembered doing that one specific drawing, and some of the others I had forgotten about as well. In reading it now, with a lot more self-awareness, I can see why this book, more than any of the others in the series stuck with me. The drawing I did cemented the image in my mind, but the story says a lot about who I am, and who I was. But that’s a separate blog.